building bridges to relevant neighbouring technology fields (META-RESEARCH). 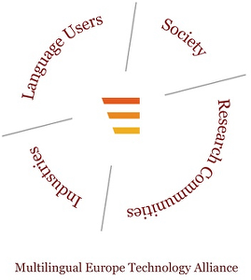 META, the Multilingual Europe Technology Alliance, brings together researchers, commercial technology providers, private and corporate language technology users, language professionals and other information society stakeholders. META will prepare an ambitious, joint international effort towards furthering Language Technology as a means towards realising the vision of a Europe united as one single digital market and information space. Language Technologies will enable communication and cooperation across languages, secure users of any language equal access to information and knowledge (especially with regard to the common digital market), build upon and advance functionalities of networked information technology. 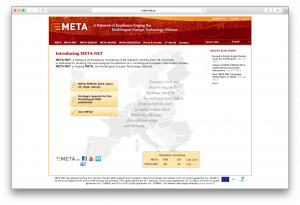 META is currently being built by META-NET, a Network of Excellence dedicated to fostering the technological foundations of a multilingual European information society.